Hello, and welcome to the Vivian MirAnn Burlesque website! Here you'll find all kinds of great things; information on past, present, and future shows, photos, links for great Albuquerque burlesque, New Mexico related sites, plus a whole lot more. Of course, you'll also find everything Vivian as well! The page is almost always under construction, so I hope you'll check back often to see this grow. When using the menu above, you may hover and click on menu topics in the bar, or hover and click on the drop-down menu selections as well! It's the largest burlesque and sideshow event in the Southwest...bringing in acts from across North America for four days of festivities, shows, classes, and a whole lot more! 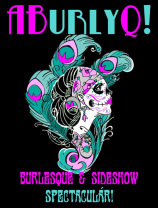 Keep an eye on www.aburlyq.com as the gang at GCB&V starts the planning processes for the next installment of New Mexico's largest burlesque and sideshow weekender. It's an event you do not want to miss!